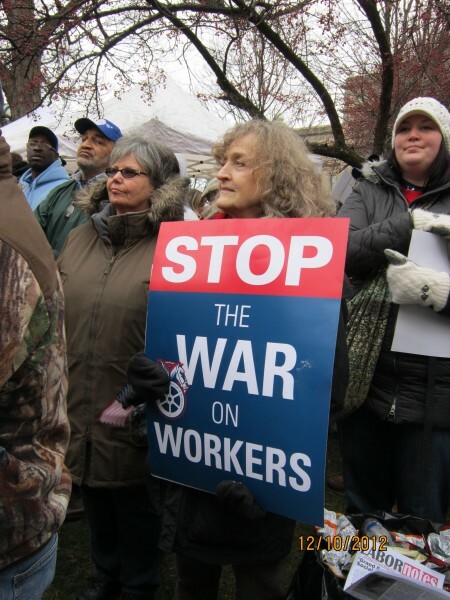 Michigan unions stage massive protest against ‘right to work’ laws | Fight Back! 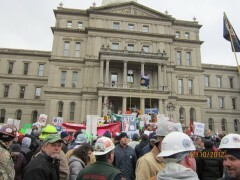 Participants in protest against Michigan "right to work" laws. 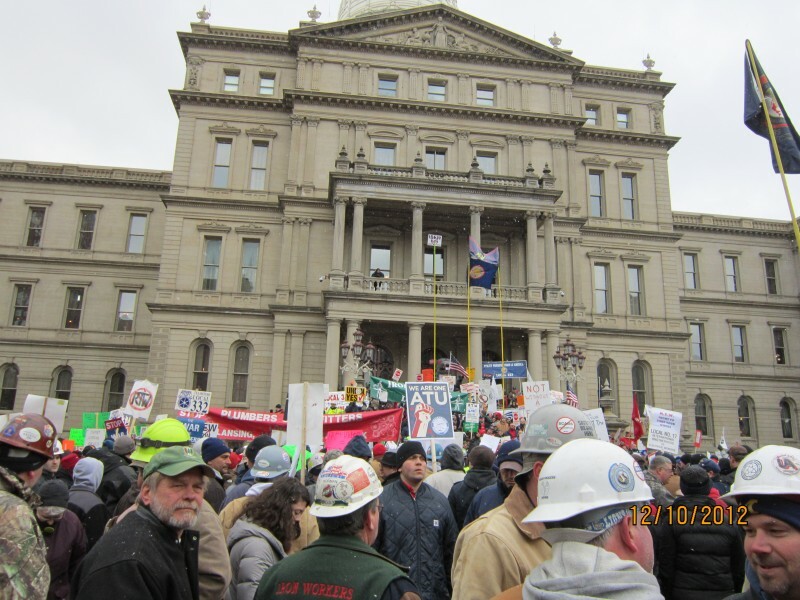 Lansing, MI - Upwards of 10,000 union workers and their supporters rallied outside the Michigan State Capitol today, Dec. 11, chanting, “Kill the bill!” People of all ages rallied, from Vietnam Vets to high school students. The United Auto Workers, Michigan Teachers Union, government workers with AFSCME and AFGE, construction, fire fighters and other unions joined together to oppose so-called ‘right to work’ bills. Michigan Republicans caught Democratic legislators sleeping on the job, and launched a surprise campaign, speeding the ‘right to work’ bills through the House. The vote by Michigan legislators to hamper government unions passed 58 votes to 51. A second bill affecting the private sector, like auto plants, passed 58-52. It allows workers to opt out of paying dues to the union, while benefiting from a union contract. It is a step by Republican politicians aimed at destroying unions altogether. Now the bills go to Governor Rick Snyder, who promised to sign them, reversing his earlier position. Snyder, a Republican, campaigned for governor presenting himself as “the Nerd”, but once in office ran a far-right agenda benefiting the wealthy and corporations. When the bill passed the House, demonstrators chanted, “Don’t sign it!” both inside and outside the Michigan capitol building. The governor called out riot police, including riot-clad horses. Former Congressman Mark Schauer of Michigan and other union members were pepper sprayed by police as they attempted to negotiate a path to move away from the capitol building. Then around noon, union rank and file members knocked down a large tent belonging to a handful of anti-union types. The union members reportedly told the misnamed Americans for Progress that today was the union members’ day to protest and chased the corporate toadies away after a few scuffles. Police moved in to try to protect the corporate funded anti-union activists, but arrived too late. Unions mobilized broadly across Michigan for today’s protest, including unions arriving from the state’s Upper Peninsula. Labor activists also came from Wisconsin, Illinois, Indiana and Ohio in solidarity. The union leaders’ message is “strong unions mean a better life for all working people.” In states with ‘right to work’ laws, wages and benefits are amongst the lowest in the country. The battle is going to heat up again prior to Governor Snyder signing the bills into law. Jesse Jackson arrived in the afternoon and, using the people’s mic, called for a one-day general strike.